Fifth Edition Fantasy is here! 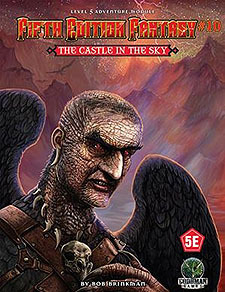 This adventure module is fully compatible with the fifth edition of th world's first fantasy RPG, and is ready to play in your home campaign. Bold adventurers cross paths with an ancient castle, adrift in the winds above. What they find there is a history of intrigue and warfare, with time folding and unfolding all around them. They are heroes foretold byt the architect and ruler of the palace, the ancient elven wizard Kaligby. He looks to them, across time and space, to aid him in uncovering the ancient evil that has led to centuries of warfare and death. What will the characters find as they walk the history of the Castle in the Sky?